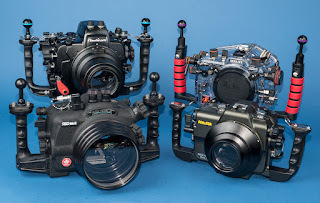 Housings pretty much follow the major camera groups in terms of size, construction, design and features. But there are lots of variation and many manufacturers are carefully considering how divers use and travel with their housing. Materials: Generally plastic carbonate or milled aluminum. Finishes include anodizing and/or powder-coating. Latches: There are several types: metal clip latches, latches integrated flush into the housing body, cam-lock, swivel. Ports also can have latches. Controls: Are most if not all camera controls available? How easy do they work for you? Can you shoot without “looking up” to align a control? Are the buttons far enough away from each other to use with gloves? Are knobs smooth to roll and allow fine adjustments? Are controls dedicated to one function, or shared between several? Controls will work easier in the water as they’re designed to be under pressure. Ergonomics: How is the layout of the controls? Can you reach them easily? What about the handles and feel of the housing in your hands? Ports: How do they attach? Are they easy to work without difficulty? Generally the two systems are screw thread or bayonet. There are also systems where the port is held on with water pressure and small latches. Size & Weight: How bulky is the housing? Most are close to neutral in the water. Don’t be overwhelmed by weight and size on land; housings are designed to be used in the water. Arm floats can be added to help. Even the largest housing is fairly easy to swim with, but every diver needs to be careful of their buoyancy and task loading. 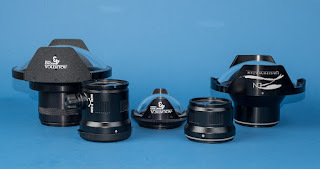 DSLR, SLR, and even some compact housings use a separate port for housing lenses. These are generally sold separately. Light physics mean that as take optics underwater we loose 1/3 of our field of view (FOV) through refraction, dome ports correct for that loss and correct for blurry corners as the image bends. Flat Ports: Are used for Macro lenses and some consumer mid-range lenses. They utilize refraction to magnify close-up subjects larger. Generally use optical glass. 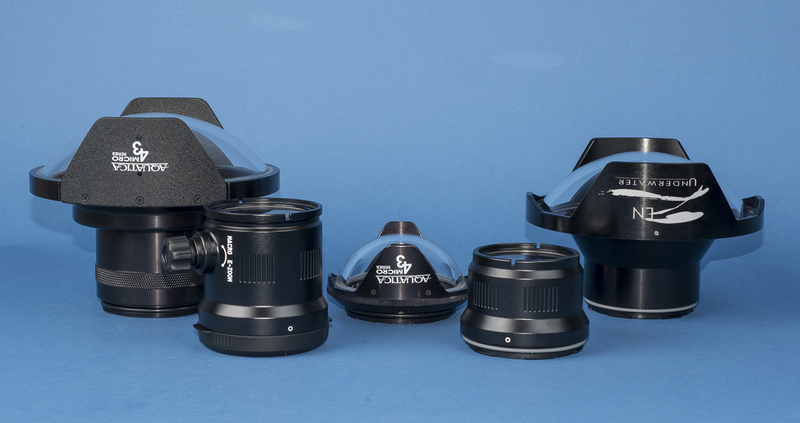 Dome Ports: For wide angle lenses. 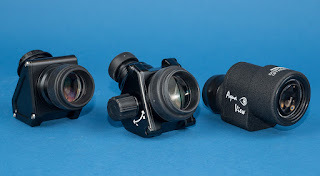 Alters refractive optics to give a wide FOV by creating a “virtual” image just in front of the dome port for the lens to focus on. They can be acrylic or optical glass with mounts made of plastic or aluminum..
Acrylic: Less expensive and lighter in weight. Shoots quite well, but can have more reflections. Can be scratched easily, but are easy to polish. Glass: More expensive and heavier. Gives the highest quality images with less reflections. Hard to scratch, but when scratched can be very difficult to repair or polish. 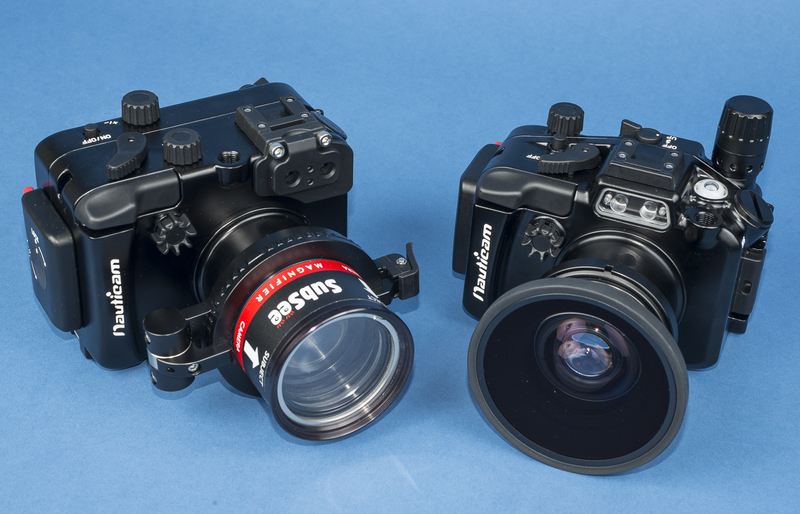 Lens Gears: Adjusts zoom and focus rings on the lenses. They are accessed from an external knob on the housing or port. Are they easy to take on and off the lens and positive in actuation? 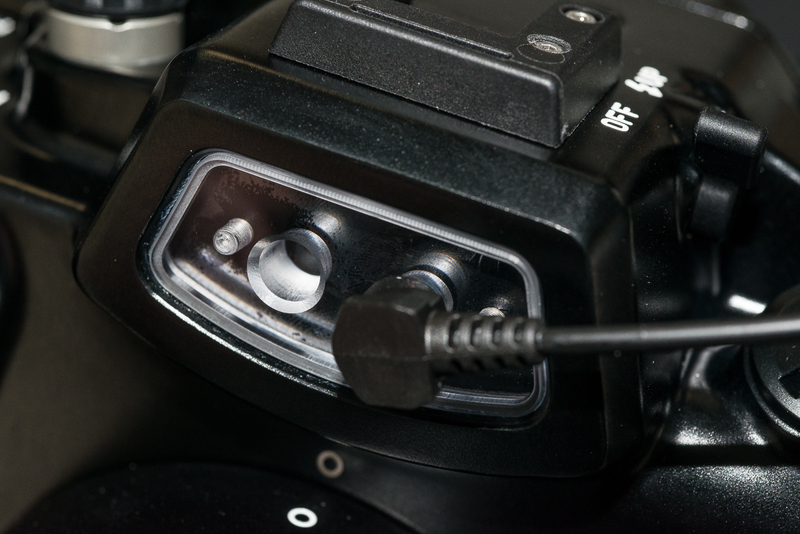 Add-on wet lenses can be used on the outside of ports. They can be changed underwater. 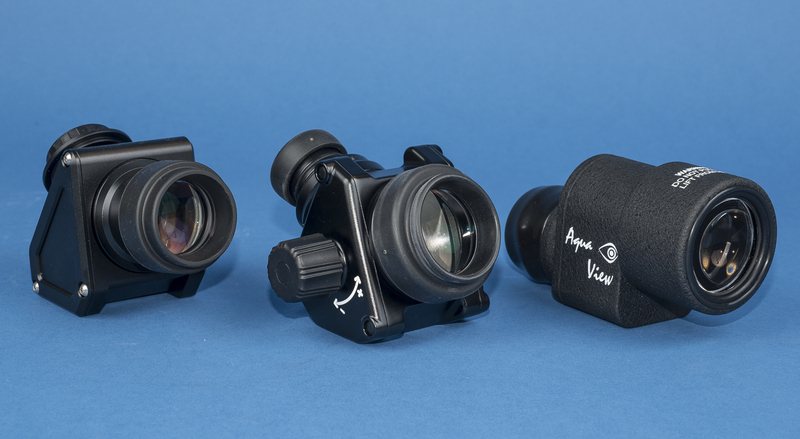 Macro “diopter” lenses: Makes the image larger and allows closer focusing. Wide angle lenses: Gives a larger FOV. Can be either a refraction replacement or true wide angle that extends the field of view (FOV) of the camera. 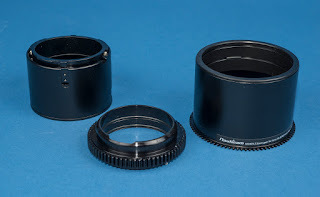 Holders: A holder for macro lenses can be utilized to flip the lens in/out of position quickly. But they can’t be used with wide angle lenses as they cause vignetting (darker corners). 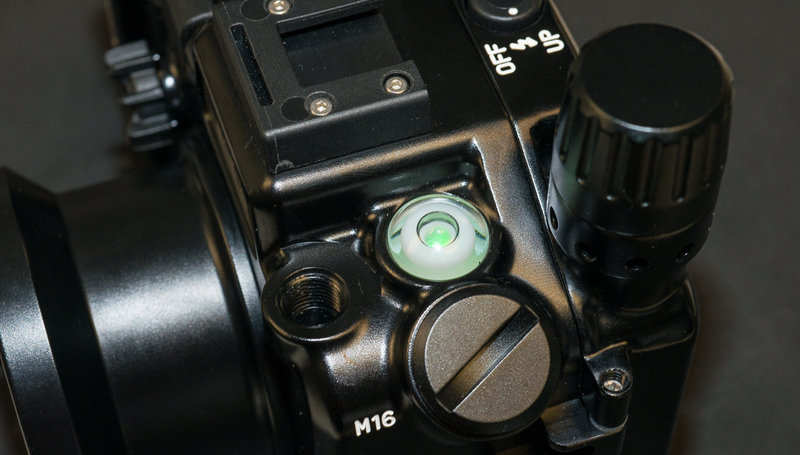 Accessories: Viewfinders, Leak Detection and other Options. Consider how extendable the housing is for adding external monitors for video, viewfinders and other devices. 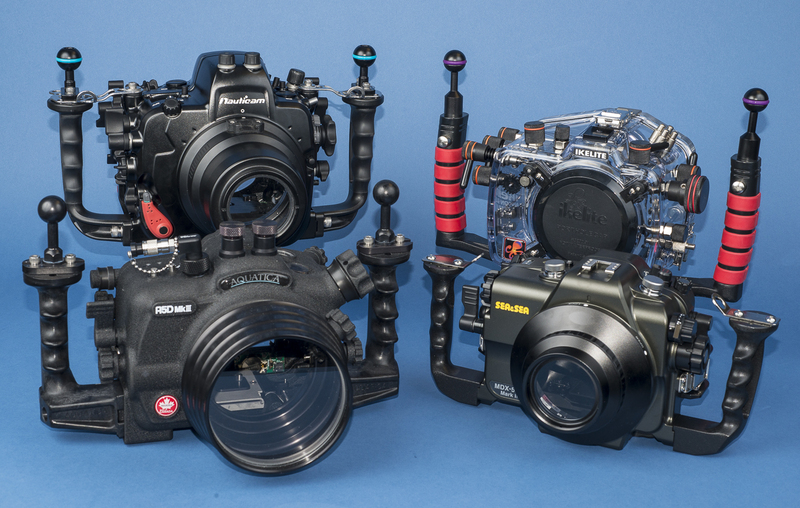 A vacuum leak detection system can take the worry out of taking your camera underwater. Lanyards and rope handles make transporting your system easier. 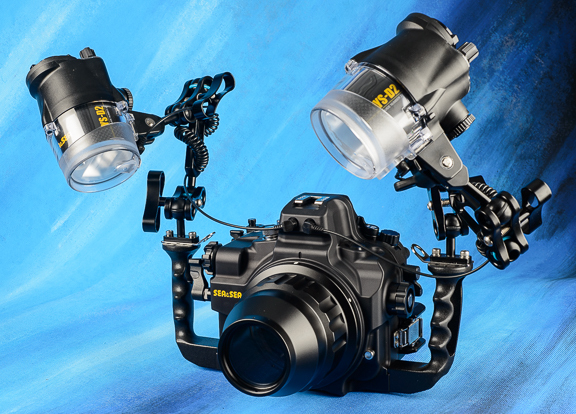 Electrical Bulkheads: Uses an electrical signal to connect to the camera’s hotshot and trigger the strobe. Fiber Optical: Uses a thin fiber optic cord to transmit the camera’s flash to an external strobe. The strobe mimics the camera flash and tricks it into turning on and off at the right time. No need for a physical hole in the housing, just a clear area for the light to go through. Fiber optic cords have become the new industry standard as they are less expensive and worry-free from flooding. 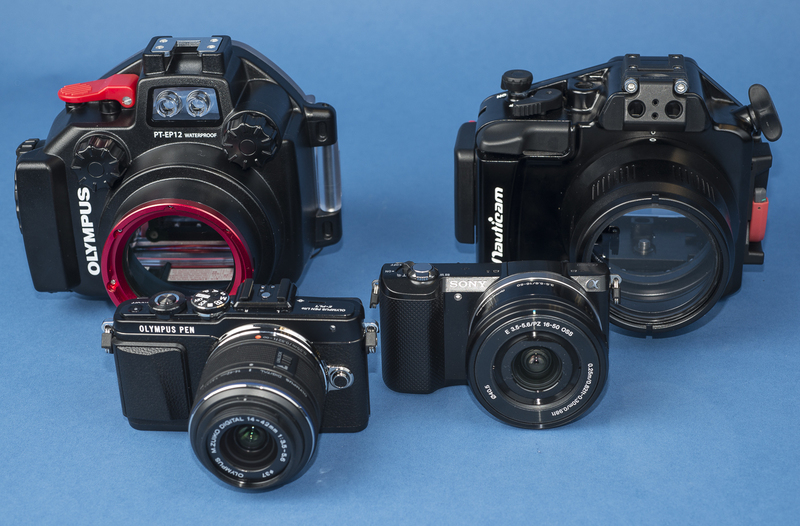 Flash Triggers: These work with cameras that don’t have a flash or can speed up the flash recycling or add TTL-auto operation. Make sure the housing you are selecting has the ability to install one if that ability is important to you. When shopping for a camera and housing, don’t forget that they will become part of a larger underwater photo system that includes lighting, a tray and arms. 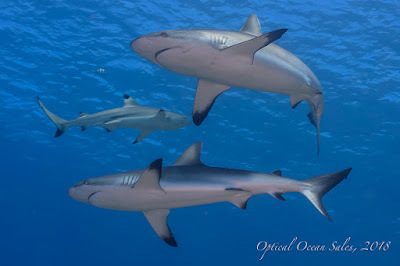 Good lighting is as important, or more important, than a good camera underwater. Mounting points for arms and lights on the housing and handles, or even on macro ports are important. Be sure to budget for lighting while shopping for a camera and housing. See our article and Handbook: Choosing an Underwater Lighting System for a details and information. Part of the Basics of UW Photography Series Handbooks.